Is Vacuuming Your Carpet Enough? Most people think if they vacuum their carpets regularly then that’s “enough” to keep them clean. Is it? Probably not. If you truly want to keep your carpet clean, you should have it professionally steam cleaned. In fact, if you were to consider carpet company warranties, most require professional steam cleaning every 12 to 24 months to keep their warranty valid. Have you checked your carpet warranty? You should read the details so you know exactly what’s expected of you. Steam cleaning is important because it affects your indoor air quality. 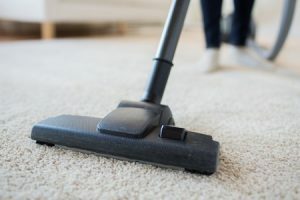 If you’ve been suffering from indoor allergies, and find yourself having all sorts of headaches and nose problems, your air and your carpets might be messing with your head and sinuses. And if you have pets in the house, your carpets are probably in desperate need of professional steam cleaning, to really get thoroughly cleaned. Steam lifts dust from deep within carpeting. Vacuuming can’t accomplish that task. Over time, without steam cleaning, if carpet gets wet, it’s highly likely that you’ll experience mold growth– and you don’t want to be breathing that! Should you vacuum carpeting? Yes. It’s a good thing to do every week. But just like it’s important to brush your teeth and floss, vacuuming and professional steam cleaning work in tandem. Don’t just do one– do both. Oh, and here’s a tip: slow down when vacuuming, allowing your vacuum to do its work better than if you go too fast. What about area rugs? What should you do to clean them? Get a broom and beat them every six months or so. Do this outside, where you can also shake them out. If possible, wear a mask over your nose and mouth so you’re not breathing in the junk released from the area rug. Should you want your area rug(s) steam cleaned, that’s a good idea– do this about once a year. For professional carpet cleaning, call Horizon Carpet and Tile Cleaners and Repair– in West Valley, call 623-561-6277, in Central Phoenix, call 602-404-8064, and in East Valley, call 480-351-8799.